You will have already completed workbook 1 which provides information and knowledge in a number of topics about dementia. This workbook builds on the knowledge you already have about those topics and introduces some new areas of learning about dementia. You can demonstrate your learning by completing the tasks and the short quiz at the end of the workbook. This will provide evidence to your manager of your learning. Please note some of the tasks require access to the Internet. understand the importance of working with family and friends of people with dementia. Completing this workbook and the exercises will help you demonstrate your knowledge and skills in providing care and support for those people who have dementia. From completing workbook 1 you will remember there are many different types of dementia. What causes the different types of dementia is dependent upon how the brain cells are affected. Brain cells become damaged in a number of different ways. The effect on the brain varies depending on where and how the brain cells are damaged. The damage causes physical changes to the brain. This is the most common form of dementia. It progresses gradually over time. The way the disease progresses tends to follow a predictable pattern. The damage to the brain cells usually starts in the temporal lobe of the brain which results in a person having problems with short term memory and new learning. Damage to all areas of the lobes of the brain is common as the disease progresses. Sometimes referred to as ‘stroke related dementia’. Can be caused by many small blood vessels being damaged or a single blood vessel (multi infarct and single infarct dementia). The damage to the brain cells are dependent upon where the blood vessel damage occurs so this could mean that any of the lobes are affected. Sometimes it is described as ‘stepwise’ in the way the changes occur. The way the disease progresses is very variable from person to person. This dementia shares similarities with both Alzheimer’s and Parkinson’s disease. Lewy bodies are tiny round deposits found in the nerve cells which disrupt the brain’s normal functioning. Hallucinations and delusions are commonly experienced. The person with Lewy Body dementia may react badly to anti-psychotic medications. 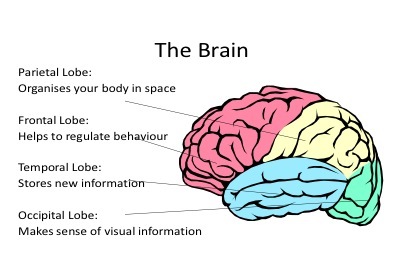 The image below shows the different lobes of the brain and provides a brief description of the work that they do. Task 1: In Module 3 ‘What causes dementia’ of the 7 SCIE modules, section 3 describes what happens in the brain and there is an exercise to match different problems to the different lobes. Completing this section will help to link to what difficulties a person will have when each of the lobes are affected. Download a preformatted table and use it to list the difficulties a person may experience when different lobes are affected. forgetting things e.g. ‘Where am I’? losing things e.g. ‘Where are my keys’? Maintaining the physical well being of the person with dementia becomes increasingly difficult as the person needs increasing support to stay physically well. Good diet: is the person getting enough to eat, is this a balanced diet and nutritional? Being free from pain and infection: is there any sign of physical illness, which could be causing pain? Environment: is the room warm/cool enough? Are there things for the person to do? Are there people for them to talk to? Difficulties in communication may lead to people with dementia not having their needs met properly in these areas. Part of supporting someone with dementia is to ensure they are as free from pain as possible. Being in pain does not have to be an inevitable part of getting older or having dementia so it is important to always be aware of signs that the person with dementia may be in pain. Taking time to get to know the person with dementia can help you see if they are reacting differently, which may indicate they are in discomfort or pain. Regular assessment of pain is an important part of care planning and will help you pick up any problems early on. Different pain assessment tools can be helpful in identifying whether the person with dementia is communicating that they are experiencing pain. This can be increasingly important if a person has difficulties talking and telling you they are in pain. There are many different tools which can help. For example, the Disdat/DDAT (Disability Distress Assessment Tool) and PAINAD (Pain Assessment in Advanced Dementia). Task 2: Think about how would you know whether the person with dementia you are working with is in pain? In your notebook write down what would you do. Tom Kitwood was a psychologist and a pioneer in the field of dementia care. He was a senior lecturer at Bradford University in the 1980s where he researched and wrote about ‘person centred’ dementia care. His aim was to understand, as far as is possible, what care is like from the person with dementia’s point of view. His book ‘Dementia Reconsidered’ written in 1997 brought together much of his work and is still widely used today. He was very keen to challenge the way that people with dementia are treated and to move away from viewing dementia from purely a medical viewpoint. He identified a number of psychological and social factors which people need to have met in order to maintain well-being. These are illustrated in the diagram below. Seeking out opportunities to explore the life history of the person through talking to friends and family members. Supporting and encouraging the person to engage in meaningful tasks at whatever level the person is able and comfortable to do. Demonstrating warmth and acceptance of the person when talking with them. Recognising the important feelings a person may have for past or present relationships. Being sensitive to recognise the person’s sense of reality. Enabling a person to be involved both physically and psychologically. Upholding these needs will have an effect on the person’s well being. Not having these needs met will potentially lead to ill being, that is feelings of distress and discomfort. Responding to the person with dementia when the person is confused by past memories. Can the person be reassured about where they are in the ‘here and now’? If ‘Yes’, then provide reassurance and prompts/cues to help the person keep in touch with this information. ‘You seem very sad not finding your mother’. ‘You seem to really miss your mum’. ‘It seems very upsetting for you to be still looking for your mother, I’m sure things are ok’. ‘I can see you are upset and worried but it will be all right’. ‘I know you are worried but things are taken care of’. Fundamental to a person centred approach are the concepts of equality, diversity and inclusion. It is important to understand that each person’s experience of dementia is unique. who are approaching the end of their life. In workbook 1 you considered the importance and use of life history work. Recording the person with dementia’s life history in a personal way can have the following benefits. 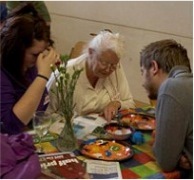 It is an activity, which can involve family/friends as well as the person with dementia. Use of photographs and key information about how a person used to spend their time either at home or work can be very powerful at helping everyone to see a person’s identity. It can provide a link to information, which might help identify certain behaviours. Graham Stoke’s book ‘And still the music plays’ shows how using life stories can put the behaviour of the person with dementia can be put into context. (See further reading section at the end of the workbook). It can be done in many different ways. The Alzheimer’s Society has produced a simple easy to use booklet ‘This is me’, that identifies personal information that is meaningful to a person. Click here to download ‘This is me’ from the Alzheimer’s Society website. Distressing situations can occur for people with dementia where for a variety of reasons the person can find it difficult to manage the situation that is facing them. But you can help, and how you communicate with the person is crucial at these times. You don’t have to disagree or argue with the person – instead, focus less on the factual content of what is being said and more on how the person is feeling. Accept that the person is distressed, and don’t blame them for how they are feeling and what is happening. Try not to take it personally if the person displays angry behaviour towards you. It may help to try and distract the person with everyday routines such as meals/drinks/walks. Consider the person’s sense of ‘reality’ and respond to this – using reminiscence to link to past stories in the person’s life and asking questions to engage the person. Look to identify how the person is feeling and respond to this. Any of the above may be helpful and sometimes a combination of responses or different approaches may be required, at different times, depending on a variety of factors. It can be helpful to think of having a ‘toolbox of approaches’ to use when trying to work out what might work best in any given situation. However it is also important that the person with dementia receives a consistent response as this will help to lessen distress with mixed messages being received. Therefore once an approach has been agreed this should be shared with anyone who may know the person, for example with other staff members and this can also be noted on their care plan. Whichever response / approach is used, the verbal/non verbal communication guidance as outlined in Workbook 1 will be helpful. Speak in a calm way; notice the tone of your voice. Use short sentences giving small amounts of information. Give time for the person to answer. Don’t argue about facts or try to ‘correct’ the person. Move to the person’s level. Maintain eye contact where possible. Use gestures, objects or signals as well as words, for example show the person an object that relates to what you are saying. Mr Porter has an Alzheimer’s type dementia and was diagnosed four years ago. He was a builder by trade and retired seven years ago. He has been living at home with his wife and she is his main carer. Mrs Porter has a chronic back problem and Mr Porter has a care worker who comes daily to support him with washing and dressing. One day when the care worker visits, Mrs Porter is looking distressed and says that her husband is constantly talking about ‘getting to the job on time’. This is happening particularly in the evenings and at times she is finding it very difficult to encourage him to settle and go to bed. On two occasions she has locked the door and left him to walk around the house and eventually sleep in his clothes downstairs. Mrs Porter is very distressed and asking what should she do. Think about what you can do to help? In your notebook write down the advice and support might you give to Mrs Porter. Make a note of the approaches might be helpful in communicating with Mr Porter. When a person is showing signs of agitation such as hitting out at others or walking around continuously it is important to consider this as a form of communication or a response to unmet needs. What is the environment like? Is this distressing the person? Has something significant changed/been moved (for example a photo or a piece of furniture)? What is going on physically for the person? (for example is the person walking in response to the need for exercise)? Are they communicating with you? Think about what they may have done in the past, for example the job they had and what it involved, what they did with their family such as walking their children home from school. Does this help you understand their behaviour better? Most importantly consider what is happening within the interaction? Any of these responses will result in a loss of dignity and an increased sense of distress for the person with dementia. Be mindful of the experience of the person. Think if there is anything you are doing which is making the situation worse. Give the person space and back away if necessary. Refer back to workbook 1 and look at the work you have already done on improving communication. Mr Salter has a mixed dementia and was diagnosed three years ago. He was being cared for by his wife Sybil at home who recently has been admitted to hospital for a heart operation. Mr Salter is now in a care home. Since being at the care home he has been reluctant to sit down with the other residents to eat and drink. In the evenings he has been continuously walking around the care home and approaches people both staff and residents saying such things as ‘I’ve done it all now I’m going’, or ‘I need to get back now’. This is becoming an increasingly distressing situation as Mr Salter is getting angry when the staff are preventing him from leaving. His daughter has said that her father was one of eight children. He had a troubled childhood and spent some time in a home she describes as being ‘for naughty boys’. 1. What needs do you think Mr Salter might have? In your notebook list any possible physical or psychological needs. 2. How might you approach Mr Salter? In your notebook write down how you might approach Mr Salter. Think about your non verbal communication as well as what you might say. This section looks at 2 different groups of medications that are sometimes prescribed for people with dementia. There is currently no cure for dementia but some drug treatments have been developed that can help to improve the symptoms of Alzheimers Disease. The drugs may slow down the progression of symptoms, delaying deterioration in some people. The drugs used to treat Alzheimer’s disease have several ‘trade’ names and are collectively known as acetylcholinesterase inhibitors (ACIs). As well as ACI’s, a new drug has been developed called Ebixa (memantine) and it works in a different way to the three drugs above. delusions and / or hallucinations. It is very important to try to understand the reasons for these feelings and behaviours and to offer psychological interventions as discussed throughout this workbook. 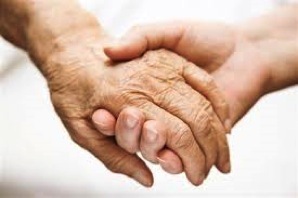 If these difficulties are not responsive to person centred approaches and are causing severe distress to the person with dementia or posing significant risk to the person, it may be necessary to refer to a health professional who can consider the need for medication. One of the types of drugs which may be prescribed (if considered that the benefits will outweigh any side effects) are called ‘antipsychotics’. risks of stroke for some people, particularly after being on medication for longer periods. a review date set, in line with local prescribing protocols. The person with dementia must be monitored regularly for side-effects as these can have a negative impact on their quality of life. Where side effects are causing harm to the person, the medication should be reviewed urgently. For people with Lewy Body dementia it is recognised that antipsychotics may be particularly dangerous. It is important to involve a person’s relatives in the decision to provide medication where the person is unable to consent to the treatment. Some recent research suggests that suggest that antipsychotics may cause a person with dementia to decline at a faster rate (Ballard et al 2005, Schneider et al 2006), which alongside the risk of side effects highlights the need always to seek alternatives. Task 5: Mr White is restless and walking around in the evenings. Think back to all the knowledge from the workbook that you have covered. In your notebook write down what alternatives would you explore before considering the use of antipsychotic medication. It is important to recognise that people with dementia may be vulnerable and at risk of abuse and neglect. sexual abuse: the person with dementia may no longer be able to consent to sexual activity. Task 6: If you are concerned about potential abuse, what action would you take? Who would you contact? Find out the local safeguarding procedures for your area of work. Check what training is available if your knowledge is not up to date. In your notebook list any relevant telephone numbers/contacts. The Mental Capacity Act became law in October 2007 and brought clear guidelines about what should happen when a person has difficulty making decisions. This is very important for people with dementia as the ability to make decisions is affected in a number of ways for varying reasons, at different times. In your notebook write down the 5 main principles of the Mental Capacity Act. Task 8: In your notebook write down an example of how you may have been involved in making a best interest decision for a person with dementia. Describe the area of decision making where the person lacked capacity and what was the best interest decision. It is necessary to take into account past wishes, beliefs, feelings and values when making a best interest decision for a person who no longer has capacity. Knowing the life history of the person will help you to do this. When a person who has dementia is in a care home or a hospital, the hospital or care home will need to consider if restrictions are being applied when caring for that person. For example may not be allowed to go outside on their own or walk into town alone. If the restrictions are significant, then a decision will need to be made by the hospital or care home about whether it will be necessary to make an application for authorisation to deprive the person of their liberty. Task 9: Find out about the DoLS procedures for your area of work. Record them in your notebook. 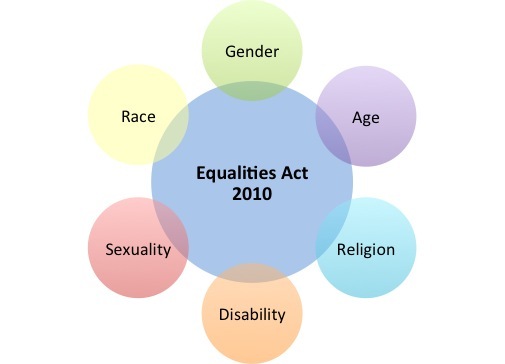 The 2010 Equalities Act provides a framework in law to protect people against discrimination. It is a law which protects individuals from unfair treatment and promotes a fair and more equal society. This new law includes a new concept of ‘discrimination arising from disability’. When a person with dementia has difficulty carrying out their day-to-day activities they will come under the definitions of ‘disabled person’ and so they are protected under the Act. coping with changes in the person’s ability to cope with everyday life. These issues can be helped by encouraging carers to maintain their own support from friends and family. It can also help carers if they are in contact with other support networks for carers of people with dementia. The relationship between the person with dementia and the people providing everyday support is crucial. Therefore providing information and education about dementia to family members and significant others is essential. Carers say that having knowledge about dementia and how to respond to the person makes a huge difference and helps them. There are a number of resources aimed at providing information and advice for carers of people with dementia. It is also important that the main carer has an assessment of their needs undertaken by the local authority social services, because carers are entitled to financial and emotional support to help them in their caring role. 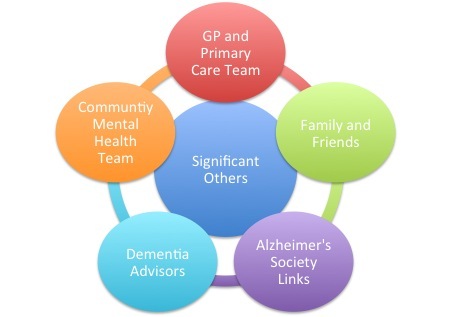 It is important to connect people with dementia and their carers to all available supportive organisations. Task 10: Find out about local resources to which you could signpost carers of people with dementia. Start with your local Alzheimer’s Society. In your notebook write down contact names, numbers and the services they offer. End of life care is a term used to describe how people who are nearing the end of their life (dying) can be cared for so that they don’t experience unnecessary pain, anxiety and stress. You may find yourself supporting someone who is in the final stages of their life, even if you are not an ‘end of life care’ specialist. It’s important for you to link to support, gain extra direction and to feel confident and able to make a positive contribution when it is needed. As a person nears the end of their life, it is important to make sure you are doing what you can to keep the person comfortable. The Liverpool Care Pathway is a nationally recognised tool which can help at this time. Good communication skills are vital for working with both the person with dementia and the person’s family. It is sometimes hard to predict how long a person has to live and people show different signs. People generally become weaker, may feel sick or find it difficult to eat and take their medication. If this happens it is important to consider the need for medication and how this can be provided in a different way. As the illness progresses the person is likely to become weaker and sleepier each day. Even when a person is drowsy or asleep, the person may still hear what is being said, music or singing, and can take comfort from hearing these sounds. Some people may become restless, agitated or confused as they near the end of life because the person is not drinking and the body is no longer working properly. This can lead to the person behaving out of character. Towards the end some people may lapse into unconsciousness. How long the person remains unconscious before they die varies from person to person. Some people die in their sleep. The National End of Life Care Programme website is designed to support health and social care staff working, in any capacity, with people nearing the end of life http://www.endoflifecareforadults.nhs.uk/. When responding to people with dementia focus on ‘stepping across’ to be with the person with dementia in their world – use imagination to improve understanding of the person’s experience, in the context of their life history and their needs. People with dementia may not always appear to ‘make sense’ when communicating their experiences. We all struggle with communication and risk giving incorrect messages within relationships. We hope that our partners and the people in our lives will be generous in taking time to try and understand who we are and how we feel. People with dementia need extra generosity given that their ability to communicate is compromised. May, H., Edwards, P. and Brooker, D. (2009) Enriched care planning for people with dementia: A Good Practice Guide to Delivering Person-Centred Care. Jessica Kingsley publishers, London. 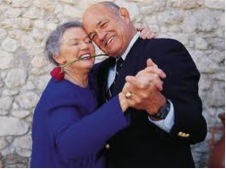 Stokes, G. (2008) And still the music plays: stories of people with dementia. Hawker publications, London. Kitwood, T. (1997) Dementia reconsidered: The person comes first. Open University Press, Buckingham. Complete this quiz to test your level of dementia awareness. i. Which lobe of the brain is important for saving information and making new memories? ii. Which lobe of the brain helps to organise your body in space? iii. Which lobe of the brain helps make sense of visual information? iv. Which lobe of the brain helps to regulate behaviour? 3. List below 3 ways that carers of people with dementia may be affected as a result of their caring role? 4. Who was one of the first people to challenge the way that people with dementia were treated? 5. 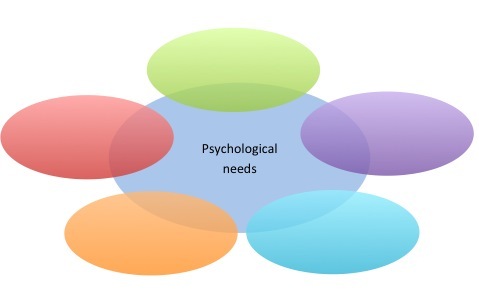 Name in the circles below the 5 psychological needs that maintain well-being. 6. Give 3 examples of both non verbal and verbal communication skills which significantly help when communicating with the person with dementia. Individuals being supported to make their own decisions – a person must be given all practicable help before anyone treats them as not being able to make their own decisions. Unwise decisions – people have the right to make decisions that others might regard as unwise or eccentric. Less restrictive option – someone making a decision or acting on behalf of a person who lacks capacity must consider whether it is possible to decide or act in a way that would interfere less with the person’s rights and freedoms of action. 8. Circle true or false to the following. 10. You have learnt it is essential to maintain the physical health of the person with dementia as this will impact on well being. For example, checking that the person is not experiencing pain using pain assessment tools. Name 3 other ways you might help a person stay physically well.